When it comes to many violin concertos they can transcend in performance both the period and the country in which they were composed but the Shostakovich concertos seem to defy this principle. This is slightly less evident in Shostakovich’s Second Violin Concerto, written in 1967; the First has been a much greater challenge for violinists ever since David Oistrakh gave its premiere in October 1955. Few works for the instrument are so inextricably linked to its dedicatee, and it certainly doesn’t help that Oistrakh has left behind a number of exquisitely refined and definitive performances of the concerto, from the premiere itself with Mravinsky in 1955 right up to a magnificent London performance two years before his death in 1974. I first heard this concerto live at a Prom in August 1986 given by Dmitri Sitkovetsky and the BBC Philharmonic under Edward Downes. This would be Sitkovetsky’s Prom’s debut and he was replacing, I think, Gidon Kremer but he gave a performance that was astonishing in its depth and musicality; to this day I have not heard it equalled in the concert hall, and only Oistrakh and Kogan are finer on disc in their recorded performances. When Sitkovetsky later came to record the concertos with Andrew Davis only shards of that extraordinary intensity came through, but nevertheless these were incredibly powerful statements that staggered brilliantly precise playing with sometimes momentously weighty depth of tone and genuinely impressive musical insights. Recorded in 1990, even today they remain as fine an alternative to Oistrakh or Kogan as any in the catalogue. Frank Peter Zimmermann’s new disc of these two concertos, recorded live in Hamburg, doesn’t ostensibly alter the recorded territory of these concertos. The advantage a live recording gives to the soloist isn’t quite as flattering to him as one might imagine, though Zimmermann is unquestionably technically brilliant (his second movement Scherzo is as fine as any ever committed to disc, for example). As rich as his tone is in this most ochre-hued of First Violin concertos, he has neither Oistrakh’s virtuosity to colour his tone nor Kogan’s sheer ability to make his instrument sing (Kogan’s Passacaglia with Kondrashin is quite something else). 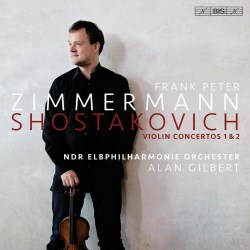 I find Zimmermann and Gilbert rather uninvolving and unexpressive in the Passacaglia; contrast this with Oistrakh and the New Philharmonia and Maxim Shostakovich at the Royal Festival Hall in 1972 and the might of Hercules would have difficulty navigating the inexorable power and mass which violinist and conductor create. Where with both Oistrakh and Kogan it’s patently clear that the concerto’s centre of gravity is the Passacaglia, this isn’t so with Zimmermann. All three soloists offer suitably immense cadenzas, though again it’s the degree of emotional depth which eludes the German violinist. Shostakovich’s last completed concerto, the Second is inhabited by a dark introspective tone and there is a pervasive sense of mortality surrounding it. Oistrakh was again the work’s dedicatee and it’s difficult to find any other soloist who has come near his understanding of this somewhat gloomy work. In many ways Zimmermann is more successful in the Second Concerto balancing the works darker and more virtuosic elements better than he does in his performance of the First Concerto. One misses the tighter ensemble work that Kondrashin gives Oistrakh (Moscow, 1968), and I’m not sure Gilbert has much of Svetlanov’s sheer Russian broodiness (in a performance with Oistrakh from the Albert Hall in 1968) to offer his soloist but the performance isn’t dogged by quite such a lack of emotional involvement. Recorded sound by the BIS engineers is very good for both concertos, though I was a little nerved in the First Concerto by finding very occasionally the recording given to the soloist sometimes suggested his tone was smaller than it actually is. The NDR Elbphilharmonie Orchester under Alan Gilbert play well enough in both concertos. Not a sensational release, I’m afraid, and not one to challenge performances of the great First Concerto with Sitkovetsky and Andrew Davis (Virgin, 1990) and certainly not one that challenges Oistrakh and the New Philharmonia Orchestra under Maxim Shostakovich (Intaglio, 1972), Oistrakh and the Leningrad Philharmonic at Salzburg (Orfeo, 1956) and especially Leonid Kogan and the Moscow Philharmonic under Kondrashin (Russian Disc, 1962) – a harrowing performance that crackles with life-and-death tension.